Who should be at the top, leading your business? Visionaries have groundbreaking ideas. Integrators make those ideas a reality. This explosive combination is the key to getting everything you want from your business. 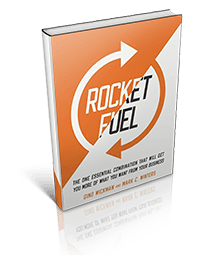 Rocket Fuel explains the critical roles of the Visionary and Integrator and how to make their relationship work. When these two people share their natural talents and innate skills, they have the power to reach new heights. Includes examples from well-known organisations such as Disney, Ford and MacDonalds. Take the test to determine if you’re a Visionary or an Integrator.